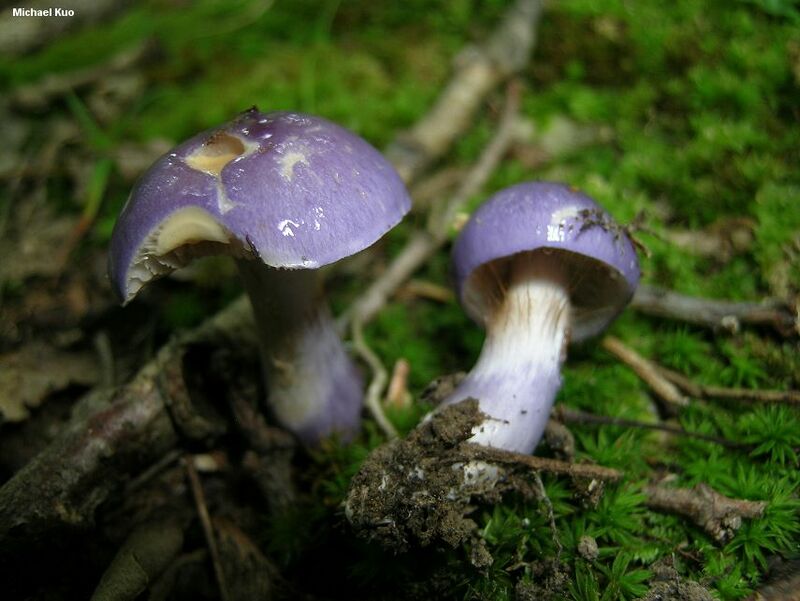 This little purple slime-ball is not as well known as its close look-alike, Cortinarius iodes--but it may actually be just as common since virtually the only way to tell the two species apart without a microscope is to lick the slime: bitter for Cortinarius iodeoides, mild for Cortinarius iodes. Go ahead. Let me know how it goes. Meanwhile, I will rely on the differences in spore sizes to tell the species apart. 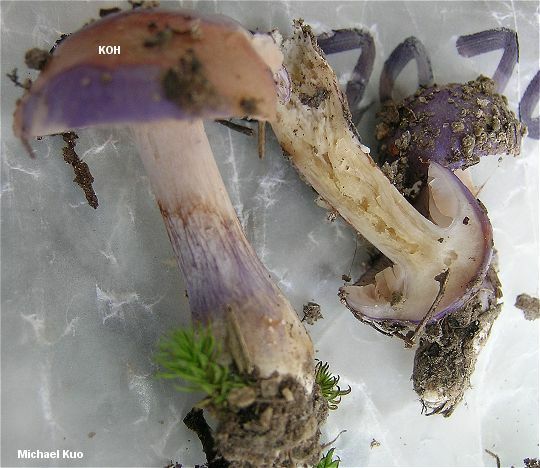 See my comments on the page for Cortinarius iodes regarding possible synonymy with Cortinarius heliotropicus Peck. Ecology: Mycorrhizal with oaks and perhaps with other hardwoods; growing alone, scattered, or gregariously; fall; eastern North America and the Midwest--slightly more western in range than Cortinarius iodes, which is more common from about Ohio eastward. Cap: 2-5 cm; convex to broadly convex or slightly broadly bell-shaped; slimy; smooth; lilac to purple, fading to pinkish gray or yellowish and sometimes developing yellowish spots. Gills: Attached to the stem; close; lilac when very young, but soon white--and eventually becoming cinnamon to rusty; covered by a cortina when young. 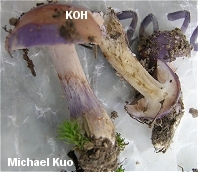 Stem: 2-6.5 cm long; to 1 cm thick; white, but when young covered (at least near the base) by a lilac to purple veil of slime; more or less club-shaped, especially when young; often with a rusty ring zone. Flesh: Purplish to white; soft. Odor and Taste: Cap slime bitter. Odor not distinctive. Chemical Reactions: KOH on cap surface erasing purple to pinkish. 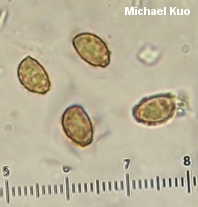 Microscopic Features: Spores 7-8 x 4-5 µ; ellipsoid; slightly verrucose. 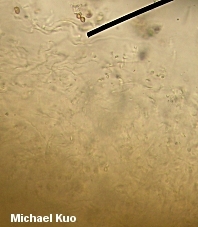 Hymenial cystidia absent. Pileipellis an ixolattice. REFERENCES: Kauffman, 1918. (Kauffman, 1932; Smith, Smith & Weber, 1979.) Herb. Kuo 07270702.